For the child of a celebrity it can be hard to step out from your parents shadow, especially when one of them is a former Mr Universe colossus who is also the greatest action movie star of all time and the former governor of your home state. So just how does Patrick Schwarzenegger do it? By strutting around in the brightest electric blue Gucci tracksuit you’ve seen in your life, that’s how. Of course the genes help him pull off such fashion blinders – not only is Arnie his dad, but Schwarzenegger is also the grand nephew of JFK – with Schwarzenegger making his modelling debut at 17, before going off to college and coming out a movie actor slash fully fledged Hollywood one to watch-er. His film career is still in its infancy but his strong fashion sense has seen him built a sizeable profile already – you need his clothes, his boots and his motorcycle. Actually, we’re not sure if he has a motorcycle. Schwarzenegger isn’t a firm part of the fashion crowd nor is he a fixture on the front row of fashion week catwalks, so his look isn’t heavily dictated by whatever the fashion elite are up to. Instead it’s a fun mixture of sometimes-outlandish get-ups like an electric blue Gucci tracksuit mixed with the sartorial timelessness of slim fitting suits. The best word to describe Schwarzenegger’s style, though, is “versatile”. While the tailoring is slim he isn’t afraid to throw on a statement upper half to fit the occasion, while relaxed denim plays a large part of his out and about look as does some discreet head gear to hide the locks. Overall, Schwarzenegger is just a well put together Millennial who dresses exactly like that – young and fun when required, mature and timeless when need be. An outfit that eerily mimics his dad in Terminator 2, Schwarzenegger opts for a textured jacket with a contrast sleeve as opposed to the leather get up of the T-800. All-black is an easy outfit to get right but one thing to keep in mind is mixing the look up by applying different tones and textures. The jacket still has the gloss of leather, but it’s a more malleable and flowing fabric so better suits the casual styling of Schwarzenegger’s look. Also listen to your mother and keep it clean – nothing ruins all-black more than a splodgy food stain down the front of your jeans. Off-duty Pat likes his denim, and who can blame him – it’s a tough and durable fabric that also happens to be delightfully cushy. Pro tip though when it comes to your jeans, try to wash them as little as possible, as the process can damage the material. Light wash denim looks best in a relaxed fit, and paired with a neutral basic – say a clean, white jumper with a bit of texture running through it to mix it up. Matching all black bottom and top halves is a sure fire way of making yourself the coolest cat in the room (just look at Johnny Cash) apart from having to dodge shadowy corners lest you get sucked up into complete darkness. The key? Break it up, baby. Here Schwarzenegger does so with a little razzle-dazzle from the chunky watch to the metal dots trimming his pockets and collar. Down below the suede Chelsea boots also offer another welcome contrast – just keep the profile slim and trim with some skinny jeans when wearing any boots with a sizeable heel. We’ve been checking out this suit and guess what? Paddy has us all fooled again as what we thought was checked is actually a gentle zig-zag, however, the similar colours and contrasting light and dark shades mean you can style it as you would a houndstooth. The pattern is a versatile and easy to wear look but your best bet for styling purposes is to pick either the black and white and harmonise it with the rest of your outfit. So just bring in the white shirt and black trousers and it really is that easy. Not all pieces from iconic Italian fashion house Gucci are in your face, but when they are, my word are they getting up in your grill, pushing and prodding you like a three-year-old in a petting zoo. And so we have this electric blue tracksuit which is so hype-beast we had to queue overnight just to nab a look. Keep the tracksuit together as it is meant to be worn and then just mute everything else down – white socks, white tee, white trainers. Don’t fight the Gucci tracksuit, as you’ll just end up losing. 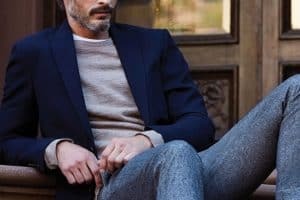 A more casual attitude is seeping into menswear tailoring, and still at the more formal end of that spectrum besides going all out shirt-and-tie is the roll neck. Schwarzenegger opts for the most classic version with an extended neckline that folds back and in a neutral black to slickly sit underneath the busy checked, double breasted suit which tradition dictates you should wear buttoned up. Also note the lack of bunches at the shoulders and breaks on the trouser hem for smart tailoring that can work for almost any occasion. In his mid-twenties, Schwarzenegger is just on the cusp where the choice of a beanie starts to become a tad dubious. We know, we know, David Beckham still wears them into his forties but we don’t think Becks really has the beanie game down. The thing to watch for is too much material flying around the back of your head – it looks messy and people are just left wondering what you’re hiding in there (Voldemort, is that you?). Also wear it a little off your face (your forehead should be showing) and with a get-up that assumes you actually need it to keep your head warm – a woolly sheepskin jacket is a much better look with it than a tee and gym shorts. The beanie is gone, obliterated, destroyed, no more. And with this purge a boy becomes a man, because that’s exactly want a tuxedo can do for you – as long you get it right. A tux doesn’t need to be flamboyant so just complete the checklist and you’ll do alright in black tie – peaked, contrast lapels, ribbon down the side of the trousers, bow tie, pocket square and of course black shoes. Now we know Schwarzenegger should really have the jacket done up unless seated but the cut of the tux is so snug we’ll excuse this lack of customary grace. Light blue velvet, a grandiose shawl lapel, and a matching silk kerchief in the pocket – are we chomping cigars and downing dirty martinis in Hugh Hefner’s 1960s man cave here? Gaudy, bright vintage colours are starting to make a return so it’s not like Schwarzenegger is 50 years too late, but blue velvet is probably a bit strong for any normal person to deal with, so tone it all done with some neutral black trousers and shoes. The double denim rulebook has been ripped up and thrown off the top floor to the baying civilians down below, but there are still some rules to follow that guarantee stylishness. The main one is pairing your double denim in a different shade, so go with Schwarzenegger’s contrasting light wash jacket and black denim jeans. A bit of rip in the jeans raises the stakes a little, but don’t go overboard, just keep it classic with a white tee and some sneakers. We’ve already seen that Schwarzenegger likes to play it like the men in black, but all black everything every day can get stale. Change it up with a pleasant autumnal green which is as close to neutral as you’re going to get without going white, black or grey. And when colours don’t clash it is easier to play around with patterns and textures as shown by Schwarzenegger’s suede jacket on top of corduroy trousers. The navy suit is menswear 101 so effortlessly and elegantly simple and easy to get right it deserves a gold star on the fridge. But if you like your style a little edgier, it could do with a play around. No tie on a crisp white shirt works well, as do white sneakers. But what sets this look apart from the rest is the cut of the jacket, with the button shifted inwards to create a tighter silhouette round the middle. Trust the Terminator’s son to have time travelled forward to the height of summer 2019, and come back with that season’s hottest look – the suit that isn’t a suit. The trend has already started to creep into fashion and is expected to blow up for next summer, but Schwarzenegger really goes for it here. Essentially, it’s two of the same fabric used for the trousers and jackets but without the details you’d expect from a suit. As it is already breaking the suit’s formality you don’t have to wear it with a shirt, and it actually works better with just a plain tee and pair of shoes. There are a lot of oranges in the menswear orchard, and yet it’s still not a colour you see all too often on the street. Which is a great shame as the more burnt shades that have made regular appearances in recent seasons and seen sported by Schwarzenegger have a rugged manliness about them that lift an outfit into the spectacular. The rusted tone works especially well balanced with an earthy grey so that you don’t go around looking like a walking talking terracotta warrior. We were getting some worrying car repair man vibes from this workwear get-up Patrick is showing off, but fashion done right comes in the little details that break an outfit up, and here it’s all about the pockets. White provides the requisite contrast against navy and to make sure the style move looks planned follow the colour through, like Schwarzenegger, in your T-shirt and sneaker choice.